The indicator identifies when a divergence occurs between price and an oscillator. It identifies both bullish and bearish divergences. It has a RSI filter option which makes it possible to filter out only the strongest setups. Can detect divergences for the following oscillators: MACD, OsMA (Moving average of Oscillator), Stochastics, RSI, CCI, RVI and Awesome. Only one oscillator can be selected per chart. Draws solid lines for regular/classical (potential reversal) divergences and dotted lines for hidden (trend continuation) divergences. The lines are drawn on the chart as well as in the indicator window. 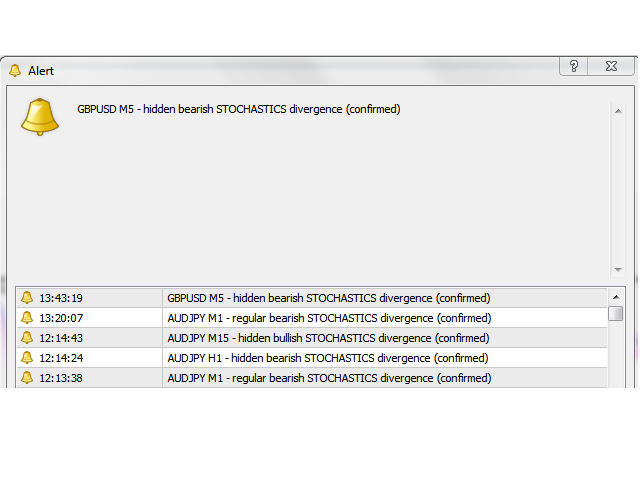 Sends an alert when a divergence has been detected. Oscillator to use: Default is MACD. You can select from any of the above mentioned oscillators. Wait for candle close for alert: When set to False you will be alerted about unconfirmed (pending) divergences. Scan for hidden divergences: True or False. Scan for regular divergences: True or False. Bars to check (divergence depth): Default is 40. Max history bars: Bars back in time for which to draw divergences. Fast MA: Default is 12 (5 for Awesome). Slow MA: Default is 26 (34 for Awesome). Signal MA (not used for Awesome): Default is 9. Period: Default period is 10. Enable RSI for regular divergences: True or False. Enable RSI for hidden divergences: True or False. RSI overbought and oversold levels: The divergence candle must form above/below these levels in order to be valid. RSI Period: Default period is 10. RSI apply to price: RSI level is calculated from this setting. Bullish line color: Color for bullish lines. Bearish line color: Color for bearish lines. Alerts: Set to True for each alert type you would like to receive. Love it! Love it! Love it! I wait for my other indicators to send me a Buy or Sell Signal on M30/H1 and then i check if there is a divergence which adds to the probability or not. Exactly what i was looking for! And FREE! Thank you so much!! Excellent indicator. Light on resources as well and really powerful. Took 3 signals last night. One in a nice profit, the other 2 in a small one but profit as well. Very good addition to my Divergence scanner. I have tested a few so far and Jan's indicator os by far the most complete and good one. Thanks Jan for this free indicator with your scanner, together is a great tool to see the over all picture. This indicator is useful for me. Thank you very much. Works just perfect for me. Taking trades only when RSI is above/below 70/30. The hit rate is very high when using it this way. Good indicator. Exactly what i looking for. Thank You Jan Flodin.